Understanding what brings customers into your stores is a big part of driving more sales, and seeing how customers respond to your marketing campaigns will be a big help towards this. 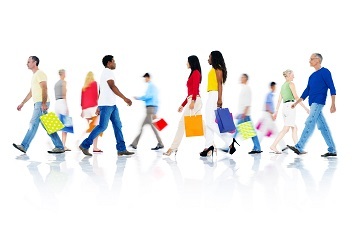 A careful study of footfall into your stores and around specific areas of stores and correlating against your marketing campaigns will help you to see what is actually driving more visits – the first step in being able to turn them into paying customers. Even once you have converted a visitor to your store into a paying customer, there is a further opportunity to increase sales by increasing the average customer spend. Irisys systems can help you to efficiently schedule your labour force to match customer demand, keeping waiting lines for the checkout short. If you can achieve this, then our experience has shown that when customers expect a quick experience at the checkout, they are willing to spend more time in-stores, and increase the amount they purchase. For some stores with a high service to sales ratio, such as jewellers and shoe stores, making sure that there are sufficient numbers of staff on the shop floor to make the most of visitors to the store is crucial. By understanding the footfall patterns into your stores to identify those busy times you can arrange your sales team’s working hours around them and capitalise on these opportunities. Making sure that you make the most of every visit to your stores and convert them into paying customers is what the retail business is all about, so this and everything that supports it is obviously a major priority. Measuring this accurately can only be done with a reliable starting point and a reliable people counter – allowing you to build an evidence based business case for driving increases.